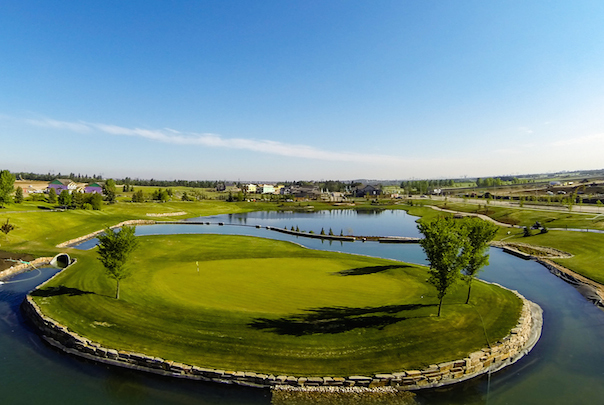 The best way to get to Jagare Ridge Golf Club is take Anthony Henday to the south portion of Edmonton. Proceed on the Anthony Henday until you get to Rabbit Hill Road. Take the off ramp and proceed south on Rabbit Hill Road until you get to Ellerslie Road (9th Ave S.W.). Turn left on Ellerslie Road to head east. Drive 500 yards and then turn right. 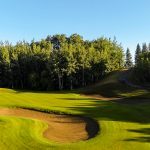 Set along the spectacular Whitemud Creek Valley, Jägare Ridge is one of Edmonton’s best course and Alberta’s newest golf gem. 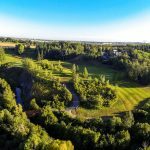 Located on Ellerslie Road, on the south end of the city, and only steps away from Edmonton’s newest communities, Jägare Ridge promises to combine high caliber golf, and stunning views, all in an accessible location. 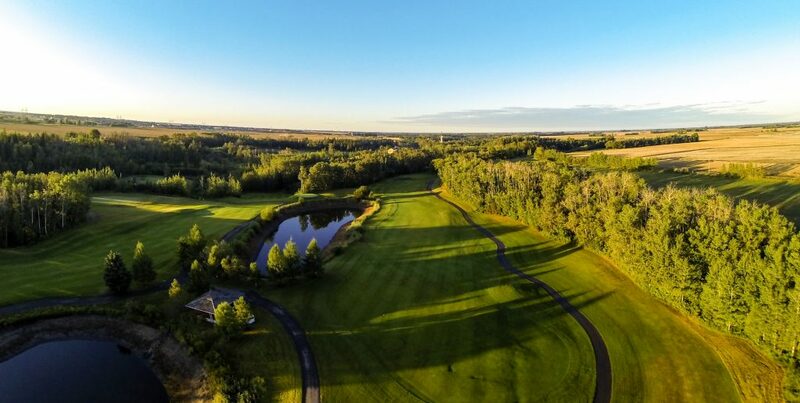 As the 6,581 yard, par 71 course meanders along the banks of the Whitemud Creek Valley, Jägare Ridge Golf Club boasts views that could only be found in the rockies. 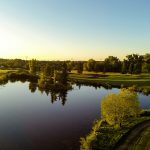 With the flowing creek, seventy-foot cliffs and dramatic elevation changes ranging up to eighty feet, combined with mature sixty foot spruce, cottonwoods, poplars and birch trees, the full breadth and beauty of the valley will hit you at every twist of the course. Clubhouse Menu: Our fully staffed clubhouse is ready to serve you, your family and your guests, giving you the opportunity to enjoy tasty meals tailored to your taste while enjoying the exceptional views showcasing the Whitemud Creek Valley and surrounding lands. Tournament Menu: Jagare Ridge offers a full-service clubhouse dining area ready to cater to your events and tournaments. 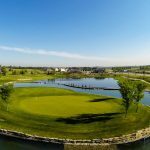 Head Professional, Tyler Rumpel, is always available to discuss your tournament golfing needs and further details regarding tournament menus. 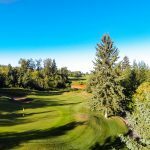 Patio: Casual dining with spectacular elevated views overlooking the Whitemud Creek Valley and a manicured golf course. It doesn’t really matter how you pronounce Jagare Ridge Golf Club, what’s more important is how you approach Jagare Ridge. The club’s Head Golf Professional, Tyler Rumpel, said he’s heard all sorts of variations on the course’s name, one of the trickiest to figure out in the Capital Region. “Yeah, I’ve heard about six or seven,” he said with a chuckle. Name queries aside, what Rumpel notes about his track, which is an absolutely gorgeous piece of property in the lowlands of Whitemud Creek, is you have to have your game face on as well as your thinking cap in order to score well on the 6,179 yard (off the blues) course. While not overly long, it is full of treachery. Much of the length at Jagare (pronounced as Yag-Er by the Pro), is made up on the par 5 holes, which off the blue tees measure out at 555, 514 and 541 on the par 71 track. Sure there are only three of them but their length makes up for the lack of a fourth. There are however several par 4 holes that are driveable, if you have the courage and accuracy, with distances ranging from the low 300s down to 296 yards, but again, it’s not just a case of grip and rip. One big factor in making this track fun is setting up at the correct spot to start each hole. In fact, the Play It Forward mantra is one that is a constant in the Pro Shop here. A guy that knows his way around a golf course no matter where it is and how it’s set up, is Class A Pro Jeff Sveen. After his recent round at Jagare, he also suggested it must be attacked in the right way from the right place. What’s surprising about this course is when you pop up out of the valley setting after No. 14. From some tight, tree-lined fairways it can suddenly become easier to score, and yes you can haul the driver out of your bag for a while, or at least until No. 18, as the open fairways and flatter layout makes for a more aggressive approach to your game if you so choose. As for tacking good numbers on your scorecard, Rumpel has a suggestion or two. 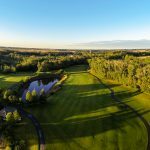 Jagare Ridge Golf Club is a semi-private course meaning the public is welcome to come out and give this challenging, and unique course in this area, a try. Green fees include power cart rental and range privileges. There are Early Bird and Twilight rates at the course, with the late day pricing beginning at 4 p.m. during the entire playing season. As for what players should expect whether it’s their first time here on the south side of Edmonton or their 100th, Rumpel said it’s all about customers feeling welcome. Getting back to that name issue, Rumpel tossed out a few mispronunciations he’s heard over the years. “Yaw-Ger is probably the most common one people use. I also hear Jag-Er but Yag-Er is the one I use and that works very well for everybody,” and that folks, is a grammar lesson that could well come in handy on your next visit to this great track where a thinking cap along with a pronunciation guide is almost mandatory when you tee it up here.